a mechanic q.v. who goes round retort house and inspects retort and furnace foods with a view to keeping them gas-tight; adjusts eccentric bolt in centre of door lever and/or forges bar forming door lever which, together with bolt, tightens door in position over retort mouth. a mechanic q.v. who keeps in order apparatus used in separating dust from furnace gases in lead extraction works. a mechanic q.v. who sets and supervises the running of all machinery for manufacture of card-board boxes; examines mechanism, makes necessary adjustments for accurate work, replaces worn parts. general term for fitters, or fitters and turners (210) q.v., who erect, trace faults, overhaul, and repair machinery running in factories and workshops or who supervise these operations; sometimes loosely applied to skilled engineers in the engineering industry; frequently specifically designated according to type of machinery, etc., tended, e.g., engine mechanic, linotype mechanic, loom mechanic, potter's mechanic, sewing machine mechanic. general terms for artisans repairing, overhauling and trueing engines and other metal parts of aircraft; cf. fitter, motor fitter (210). as for colliery fitter (210). usually a fitter (210) q.v. skilled in repair and adjustment of agricultural machinery, e.g., tractors, reaping machines, threshing machines, elevators, dairy machinery. 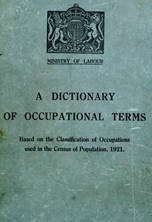 employed by ironmongers (770) q.v. to do jobbing work and repairs for customers, such as repairing kettles or saucepans, fitting or repairing locks, etc. has charge of a number of hosiery machines, and is responsible for accurate working; alters and adjusts for changes in yarn used and length of loop, i.e., stitch knitted. a maintenance man on staff of textile factory who executes minor repairs to machinery, not requiring its removal to textile machinery factory; is often done by tackier (356) q.v. attends to shafting and gearing in mill and carries out small repairs to machinery and plant; usually done by millwright (212) q.v. a skilled mechanic q.v. who repairs meters, usually a sheet metal worker (264) or scientific instrument maker (322) q.v. with special knowledge of internal mechanism of gas, electric and other meters.